Monday mornings in Nice fill me with the anticipation of a high roller getting ready to strut into a Vegas casino. I never know if I’m going to hit pay dirt or come back to my hotel empty handed. 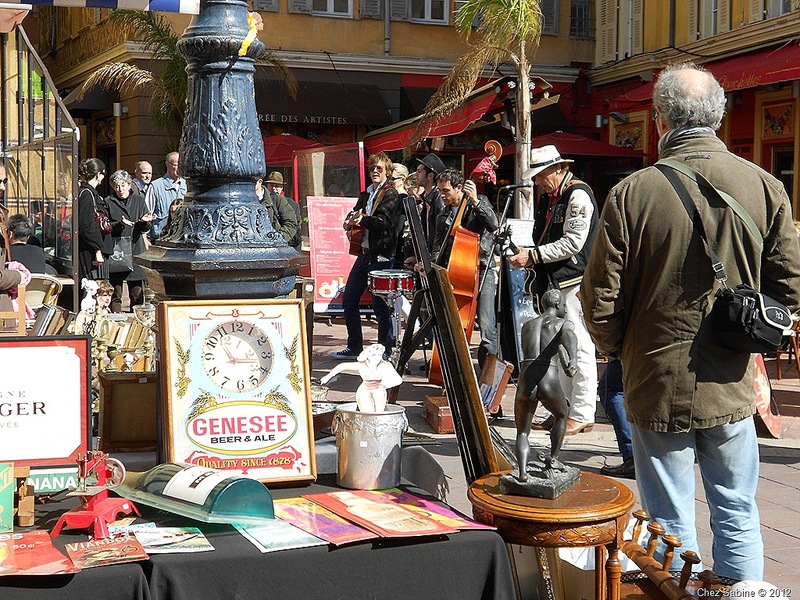 And that’s part of the thrill of this open-air flea and antiques market in the ancient Cours Saleya of Nice, where one side offers up Vieux Nice (Old Town) made up of skinny, sunless streets lined with historic buildings tinted in dusty saffron and terra cotta, while the other presents a dramatic contrast with glimpses of sparkling azure and brilliant turquoise from the Baie des Anges (Bay of the Angels) lined by the Promenade des Anglais. By the way, while Bay of Angels might conjure up heavenly images, it gets its moniker from the winged sharks that used to inhabit this piece of the Mediterranean. 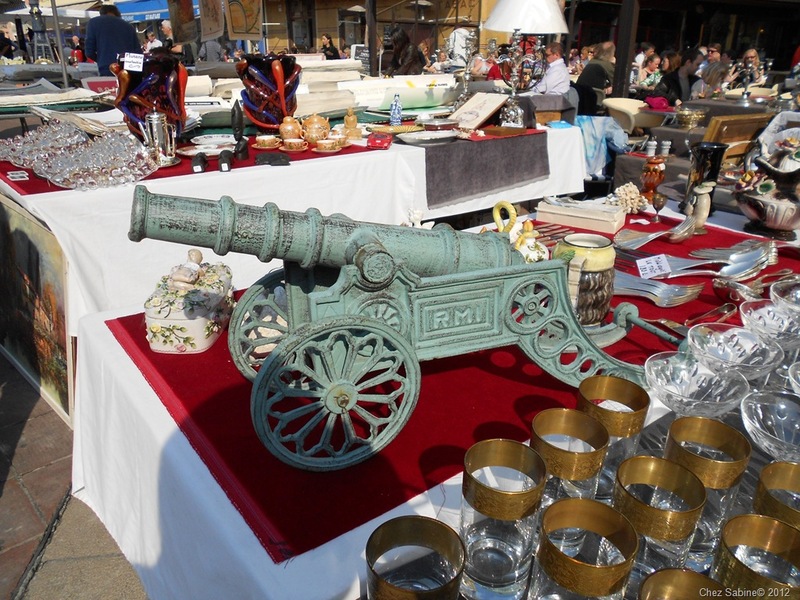 Angels aside, we’re all about the magical flea market today. If you’ve never been, then I want you to experience it here. If you’re planning to go, then I’ve got plenty of tips for you to take so that you’ll know exactly what to expect. And if you’ve been there, done that, then I hope you like the flashback. So, here’s how I get started. I don’t get up at crack ‘o tweet, but I do meander to the market no later than 10. I’m not a breakfast person and prefer to wait until I hit the Cours Saleya and find a seat at one of the many cafes where I can leisurely enjoy my first café crème (about 3 euros or around $4, no free refills) while I watch the parade and settle myself before the treasure hunt. Café crème is pretty much a latte. If you order your coffee black, you’ll get an espresso, and if that’s too much of a java jolt for you, ask for a café Americain. Depending on where you go, you’ll end up with diluted espresso or maybe a filtered coffee, but it won’t be your favorite Starbucks French roast. Just roll with it. The decaf fan should ask for café decaffeine. 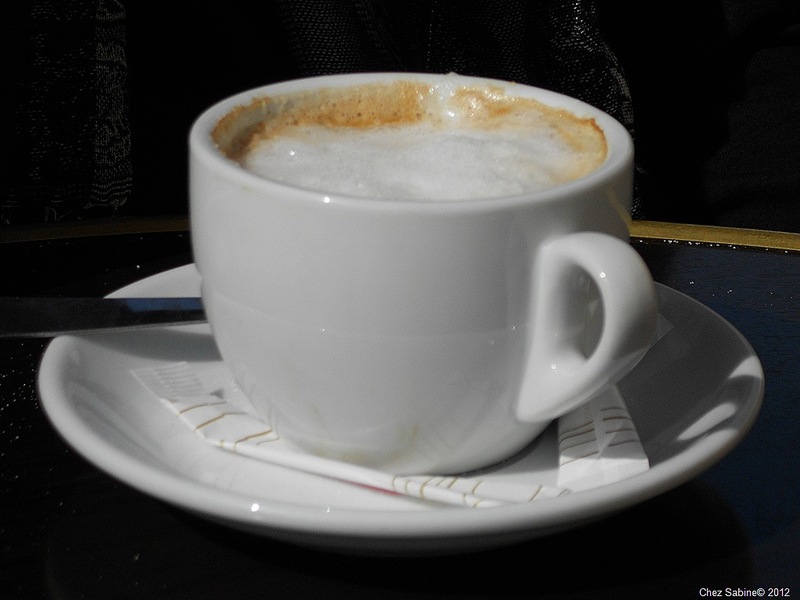 Note that in France, you’ll often be asked to pay for your coffee when it’s served. And while the tip is included, it’s not uncommon to leave a little extra change. As you sip coffee, kids, dogs, young lovers, old lovers and everyone in between will walk by. People watching is practically a national pastime. 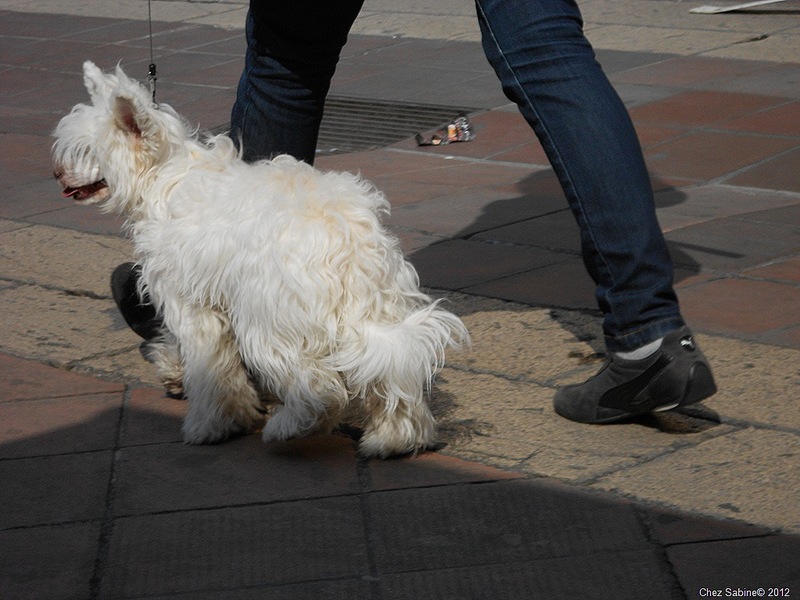 Watch your feet when you’re at the market or you could trip on someone’s fuzzy pride and joy. 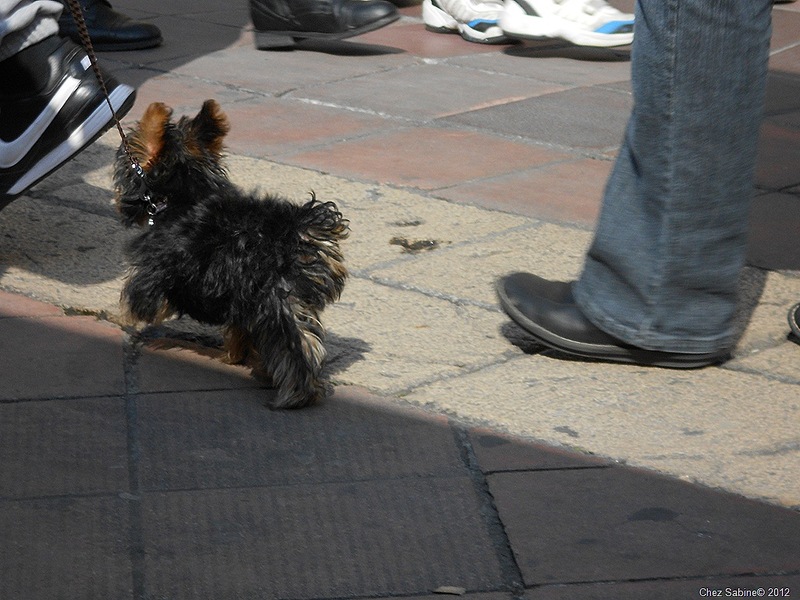 Dogs are literally everywhere, and tiny toy breeds are all the rage. 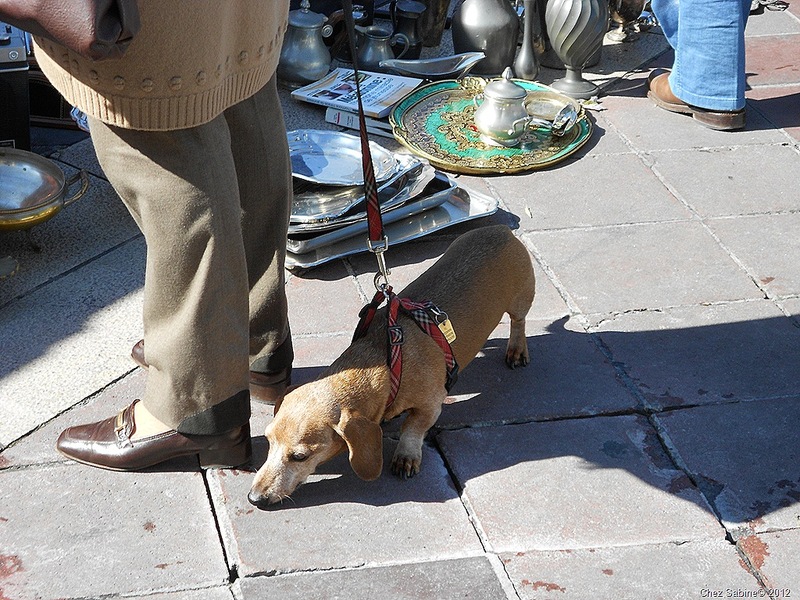 Doxie sniffs out deals at the Nice flea market. 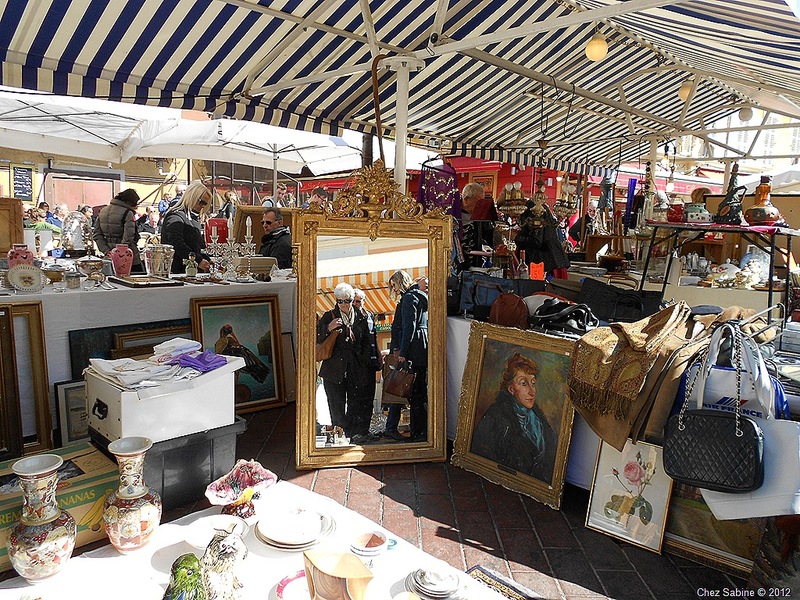 All right, enough with the coffee and pup talk, it’s time to check out the market and all of those fantastic items that you’ll want to haggle over, snap up and take home. Haggle? Do the French deign to haggle or dicker? Well, sort of, but think of it more as civil negotiations. After all, this isn’t a swap meet at the former drive-in theater where folks are selling wares from the bed of their pickup trucks. 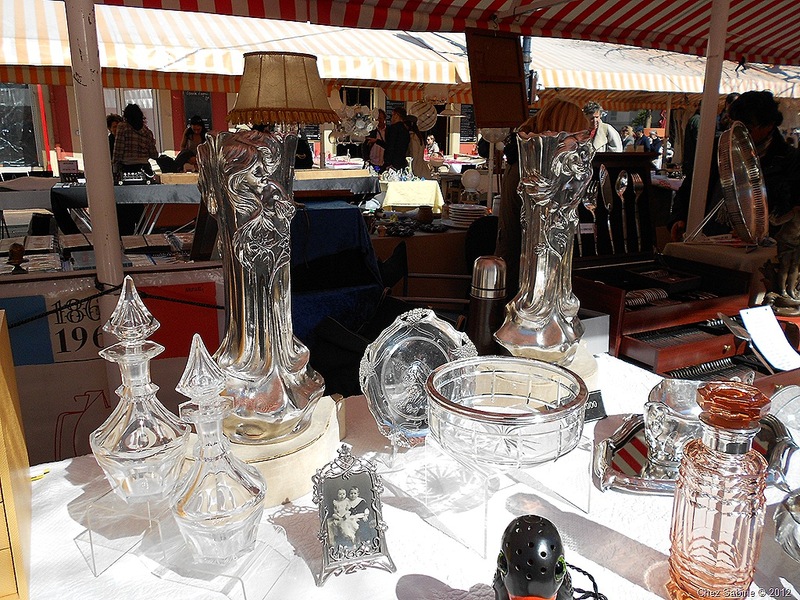 While you’ll find everything from a paperback with a bent binding for under a euro, you’ll also come across a pair of sterling art nouveau vases for more than 4,000 euros, and plenty of delicate Saint-Louis, Baccarat and Daum crystal. 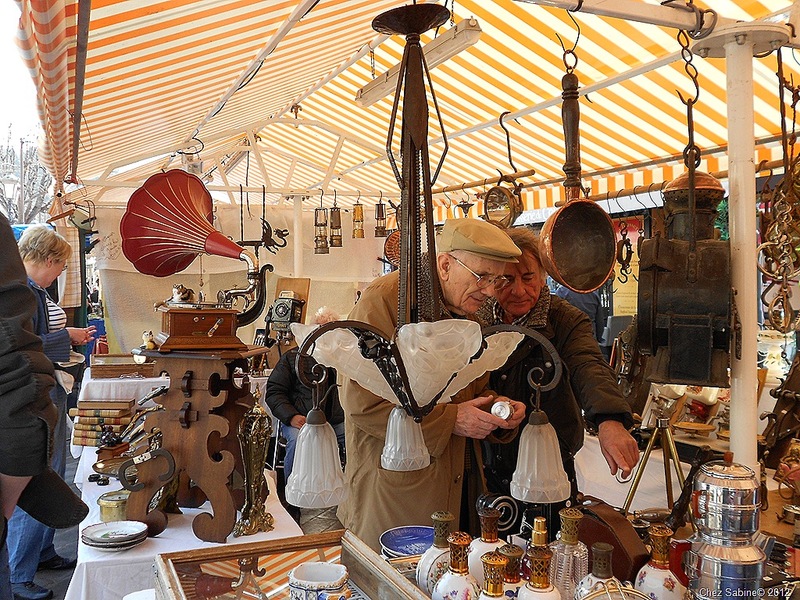 Many of the stall owners are antiques dealers with their own shops in town (you’ll find a slew of antiques stores near the harbor, an easy hike from the flea market, we’ll tour that in another post. ), and they take their possessions seriously. Most items are marked with a price or you’ll see items grouped. All of these 10 euros, all of those 20 euros and so on. If it looks expensive or easily breakable, ask the owner before picking it up. 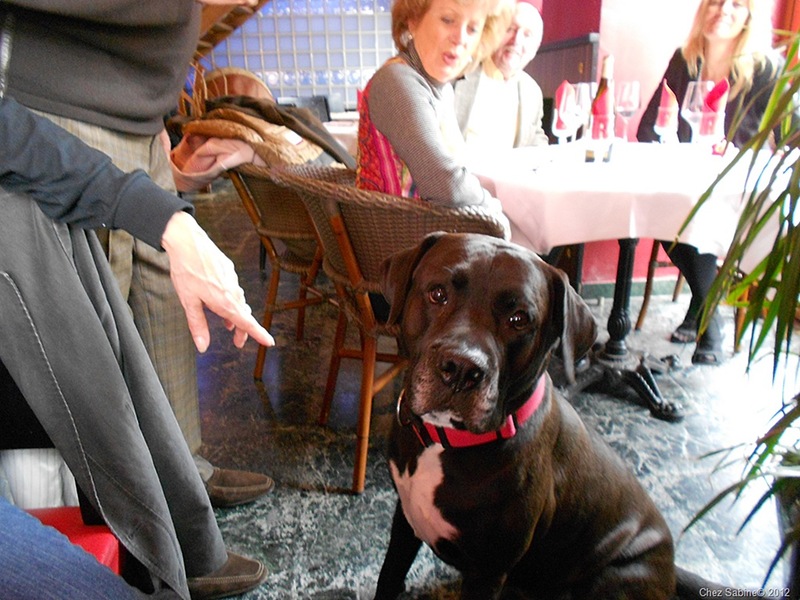 Often, just meet the owner’s eye and gesture if you don’t speak any French. And don’t be intimidated, many vendors speak a little English. After all, a lot of the visitors who come to Nice are not only American, but Brits as well. Show a little interest in an object, and the owner will often come to you and immediately let you know that he or she will give you a good price on said item — a bit less than the sticker price. So, while you’re looking the item over, let out a little “hmmmm,” that will often nudge the owner into letting you know that the price went down a bit more. 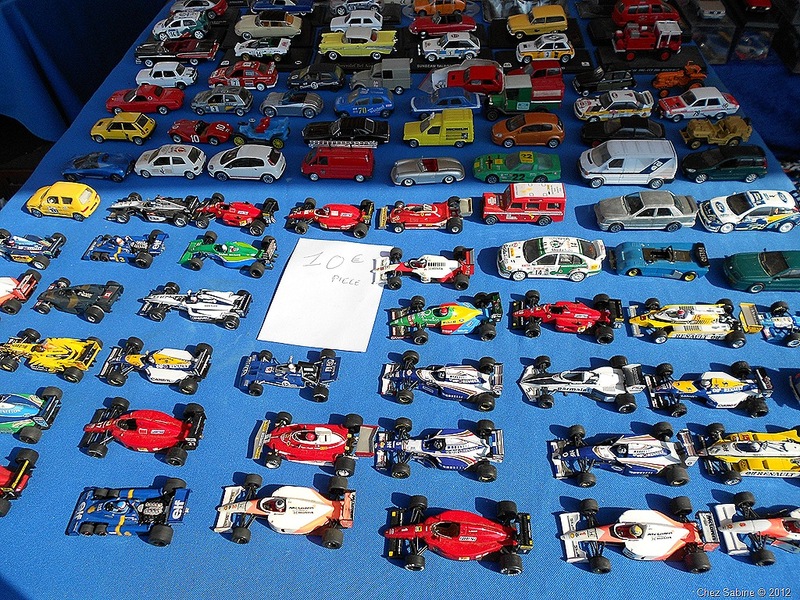 We’re talking euros versus dollars here, so if it makes you feel better, carry a little note pad and a pen, and the vendors will be happy to write down the price for you. It’s also a good way to keep track of the items you’re seriously considering. Offer what you think is fair or what you’re willing to pay, but be careful about being too cheap. Plenty of folks are going to walk by, and someone else will probably snap it up. My thought is that if it’s really a one-of-a-kind item that you’ve always dreamed of having, then go for it. But impulse buys at the market are not your friend. Shipping prices are appalling if your prize is heavy. Having said that, I have to admit to not following my own advice a few years ago. My friend and I spotted a large art deco chandelier on the ground. 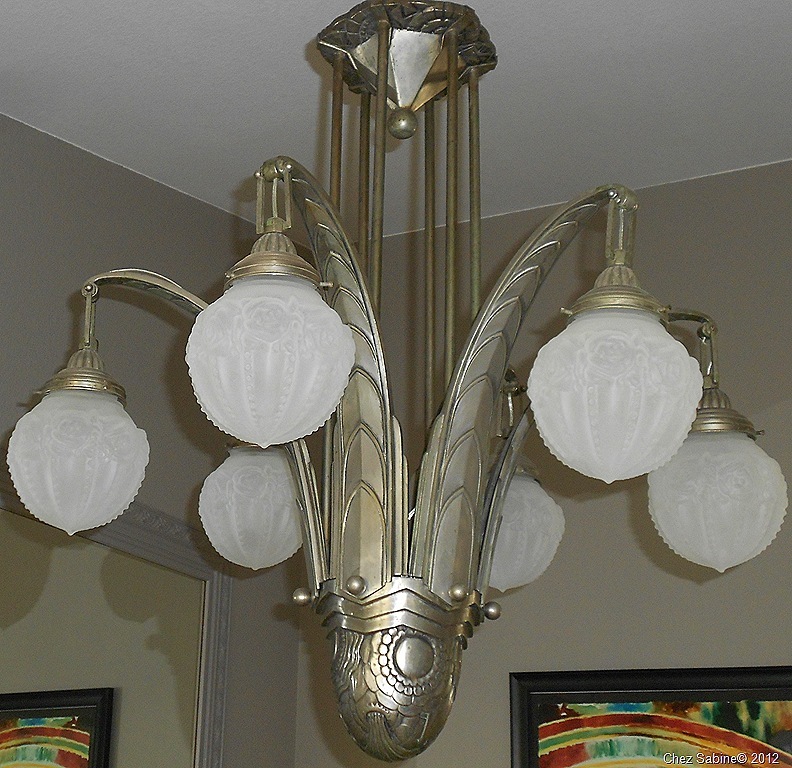 Not a delicate light fixture, but a heavy, nickel plated, you-can’t-be-seriously-thinking-of-buying-that type. And not only was there this huge octopus-like chandelier, but it had a little sibling. 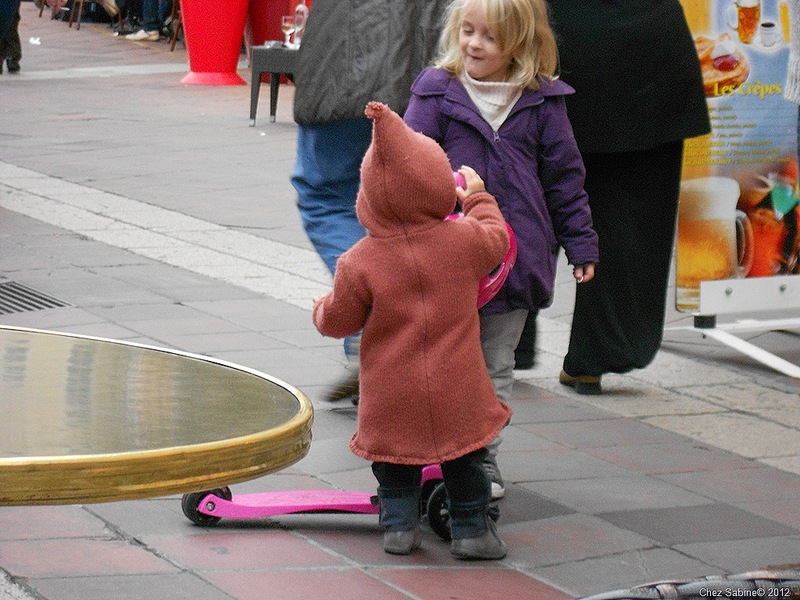 During our civil negotiations, we decided that the little one couldn’t be left behind, so we took them both and got a fantastic deal. If you’re not an art deco fan, these won’t bowl you over. And I totally understand. But, if you are, then you’ll understand that they were worth hauling back to the room in torrential rain, then buying a piece of luggage large enough to hold them, and praying their weight wouldn’t get them held up in customs. Oh, and tracking down a hardware store (not as easy as you might think) in Nice to buy a pair of pliers so that we could take them completely apart. Adopting a child from a French orphanage would have been an easier and far less stressful endeavor. But these pieces are so elusive and unusual that not getting them would have haunted me. 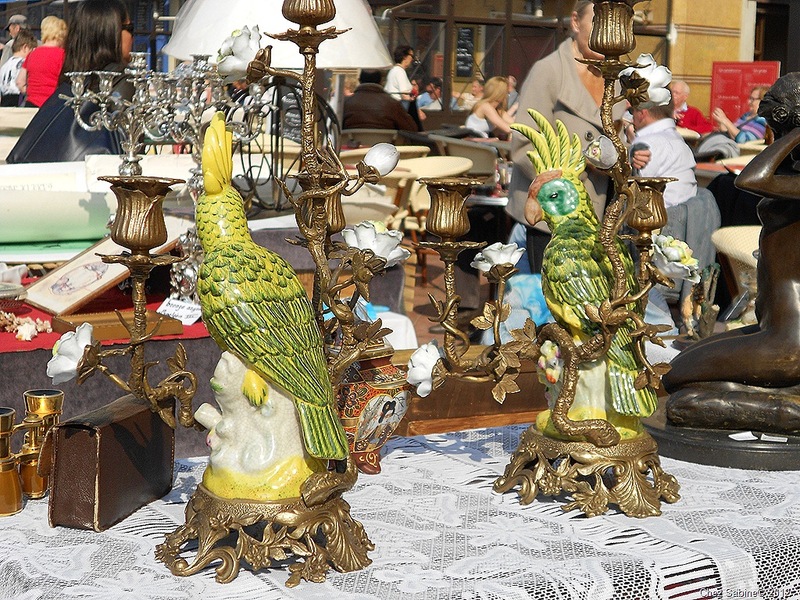 There are plenty of unusual pieces at the flea market that don’t weigh a ton or take Herculean efforts to bring home. On this trip, only three items made it home with me. For some crazy reason, I fell in love with the vintage soup ladles at the market. There were tons of them. Les louche (loosh). The prices swung wildly from one end of pendulum to the other. 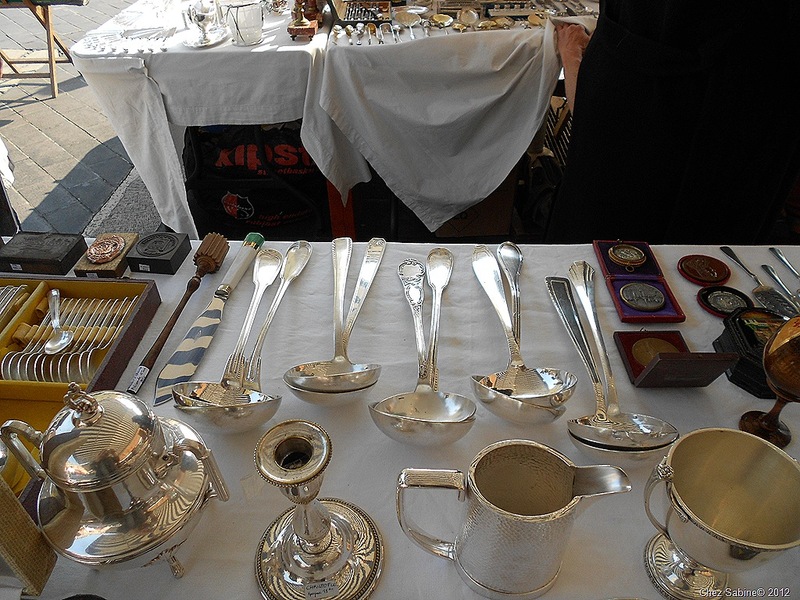 I saw some for more than 300 euros, down to under 10 euros for ladles that were pretty well beaten up. 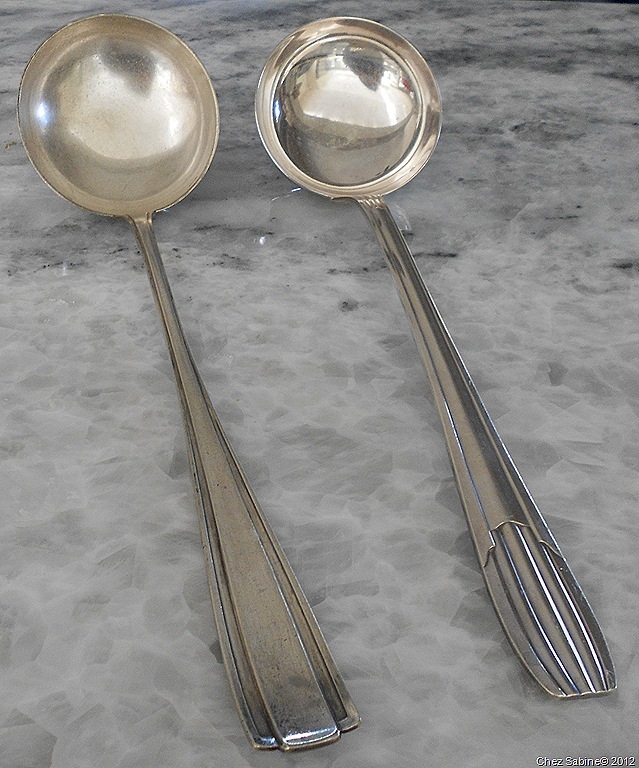 I picked up two silver-plated deco style ladles from two different vendors. One was tagged at 38 euros. I put it down and politely thanked the vendor, then walked away. I came back a while later and the gentleman said I could have it for 20. I took it without any haggling because I thought it was a fair price. It’s stamped with the silversmith’s hallmark and in very good condition. I snapped up the other one for 20 euros as well. It’s in pristine condition. 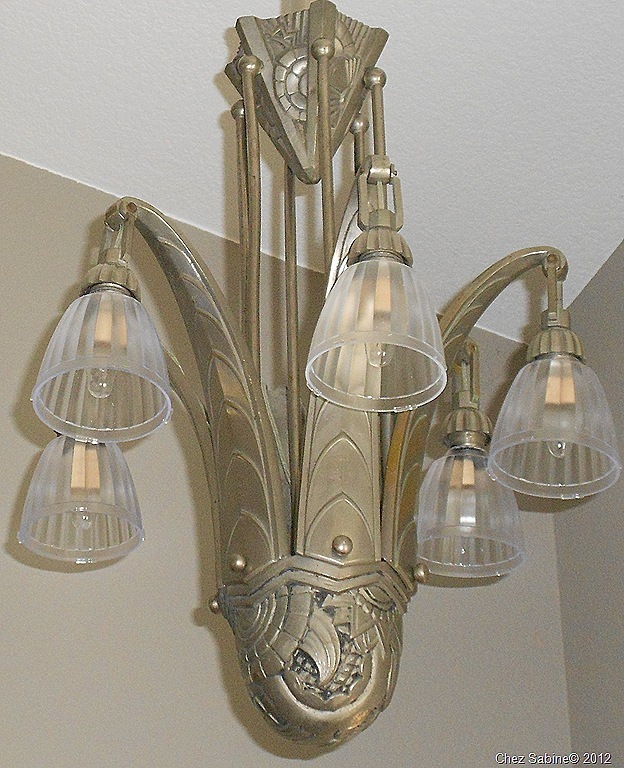 The other piece that came home also was Deco-inspired from the 1930s. It’s a tall boules trophy that now makes a perfect vase. I know you won’t believe it, but my house is not full of Art Deco, it’s just that there’s so much of it in France, making it so tempting. 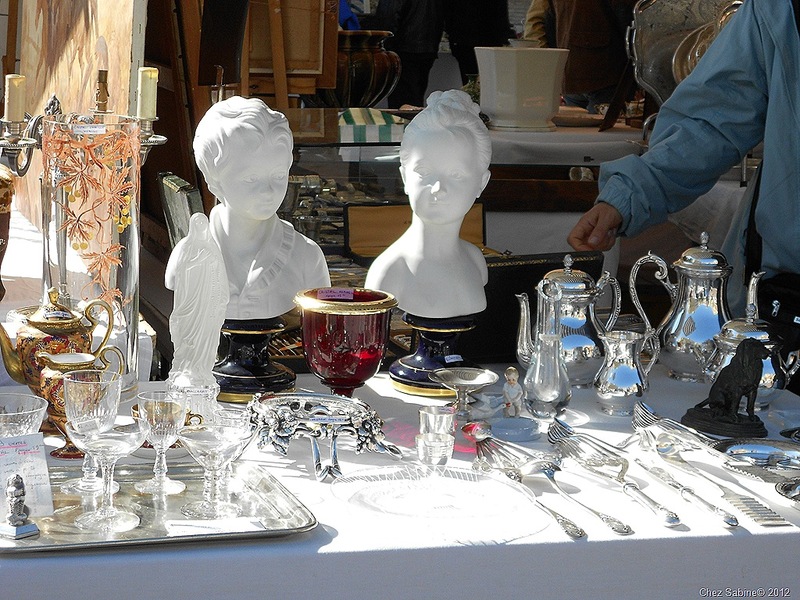 If silver plate or sterling is your thing, then you’ll swoon at the market. You’ll find tons of stunning pieces beautifully displayed. I admit that I love the idea of sterling a bit more than the reality because cleaning and polishing it is a royal pain. Tarnished silver is downright hideous, and I know this first hand. 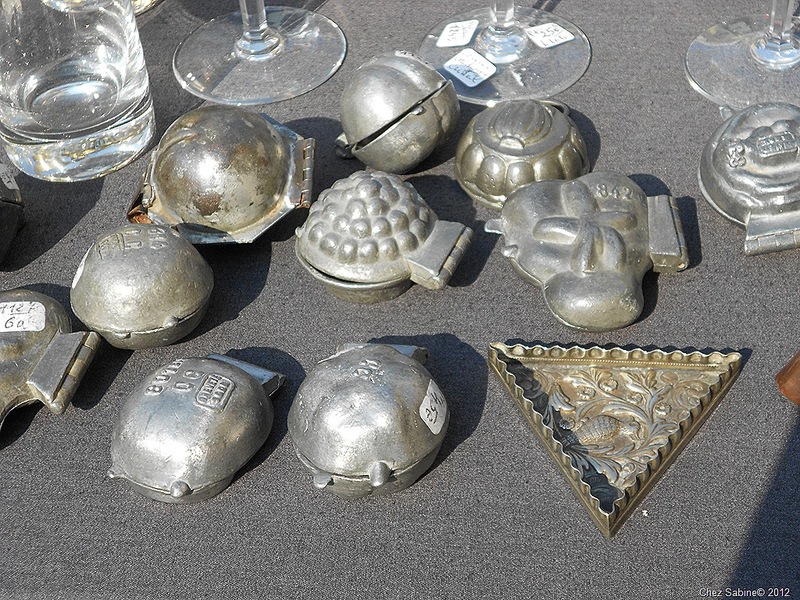 Decades ago, my mother won an ornate silver-plated coffee and tea service at a bingo game. I’m not kidding. Personally, I’d rather the powers that be at bingo just give me the cash. Anyway, I eventually ended up with the coffee service. It seemed rude to decline. It pretty much lived in the various closets of houses in which I was living at the time. When I dragged it out of the closet last year, preparing to move back to California, it was black as pitch. I tried to clean it and realized that it was impossible. I tried to give it away, pawn it and, finally, out of desperation, threw it in the bottom of a large box that was going to Goodwill. I was afraid that if it was on the top, it would be refused. I would have been mortified. Having said that, sparkling, nearly white sterling is glorious to behold. 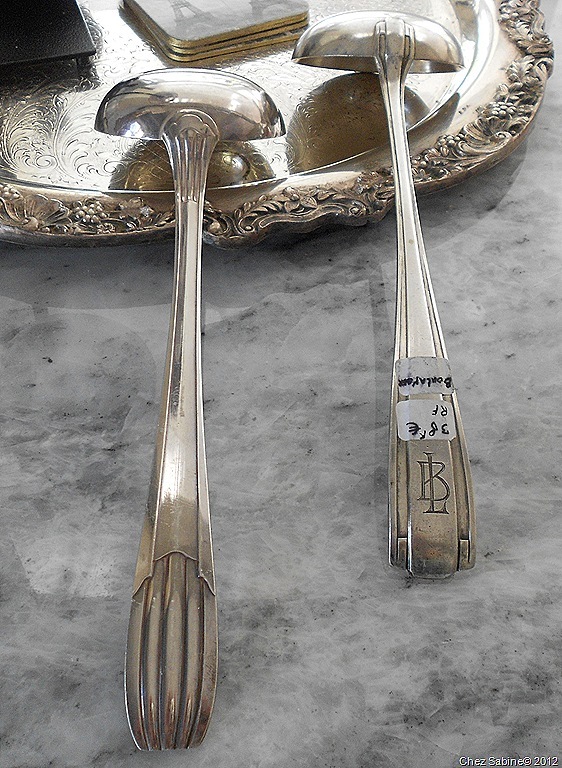 Christofle silver is huge here, even when it isn’t. So, be aware of what you’re buying or, more importantly, what you are not. And don’t be afraid to look closely at the stamps on the pieces. If it’s a known silversmith, you’ll see his hallmark, albeit a tiny one. And if you see a stamp that says, “metal alliage blanc” then it’s silver plate, not sterling. Most of the vendors are honest, but when there’s a language barrier, all kinds of unexpected results could occur if you’re not vigilant. It could be as harmless as finding goose liver pate on your lunch plate when you expected pasta or as frustrating as coming home with a set Christofle sterling knife rests that are, well, not. Sure, it’s pretty, but do you really need that big ice bucket? Let’s find something smaller. Hey, how about a nice ladle? It’ll slip easily into your luggage. Note that many of the vendors are perfectly fine with you photographing their wares. But, I like to make eye contact and make sure it’s OK if I have any doubts. 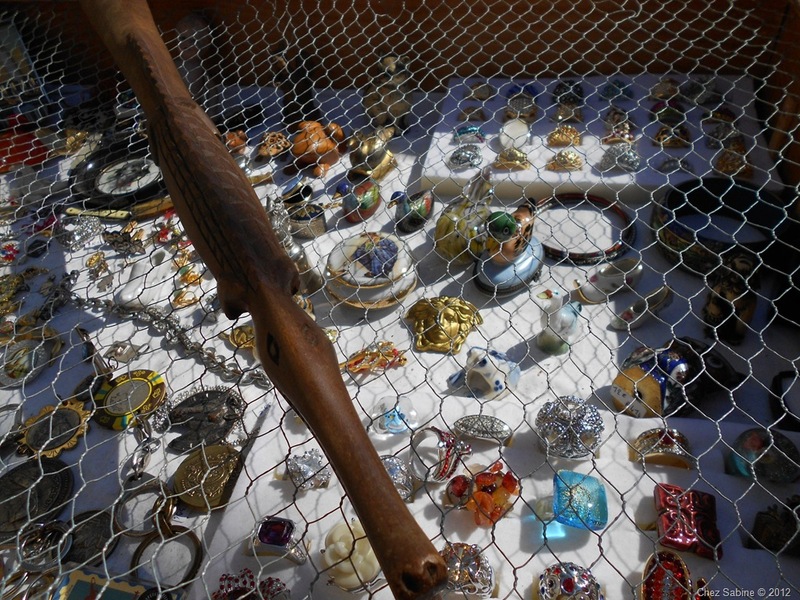 Occasionally, you’ll see a note saying “No photos” on original artwork, and once I came across a stall loaded with military medals and the owners asked that I not photograph them, and I didn’t. But, let me let you in on a little trick I use when I want to photograph something or someone and I don’t want it to look obvious. If you travel alone, this is going to be a bit tricky. So, I find my subject. 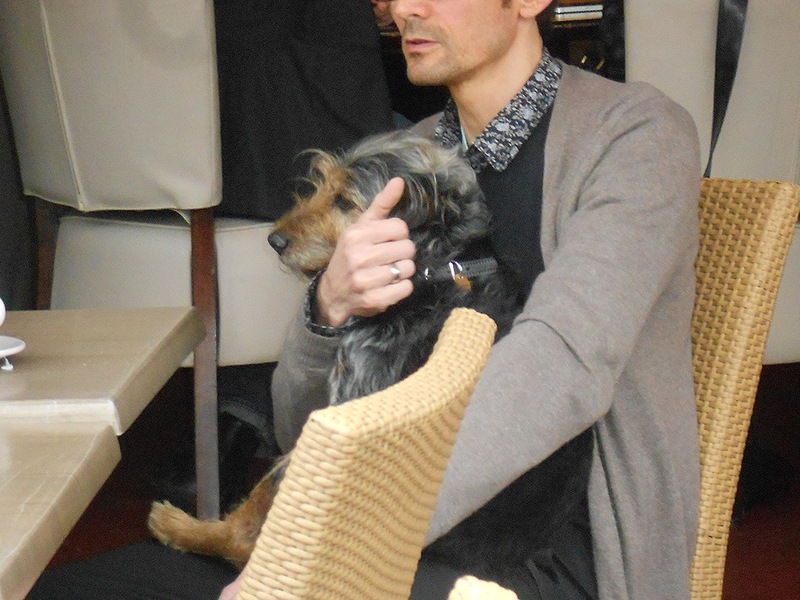 Let’s say it’s some guy eating lunch at a restaurant with his dog on his lap. I’ll position my traveling companion somewhere near the subject and start shooting. Voila! I’m shooting my friend, and I can’t help it if this guy and his dog got in my shot – and my friend didn’t. Works every time. Take a look. Personally, it makes me smile to see a dog at the table. I hope it does you, too, because you’ll see plenty of scenes like this in France. OK, so let’s continue checking out what the market holds. You’ll be happy to know that it’s chock full of affordable smalls. Those items that make clever collections or, better still, welcome and unusual gifts, and they’re easy to pack. Among my favorites are the gorgeous vintage hatpins. I have no idea what to do with them, but they’re so pretty. 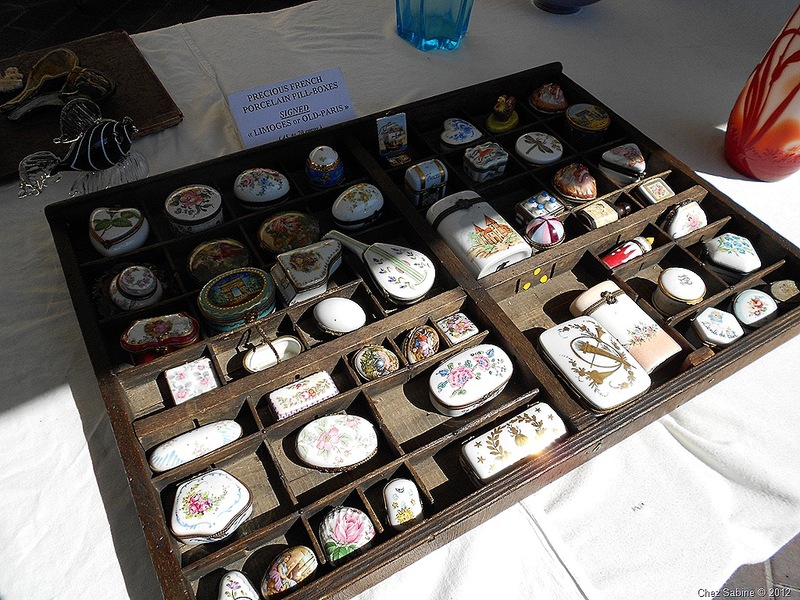 Also, there are plenty of people who collect little Limoges porcelain boxes. You can find scads of those at the market. 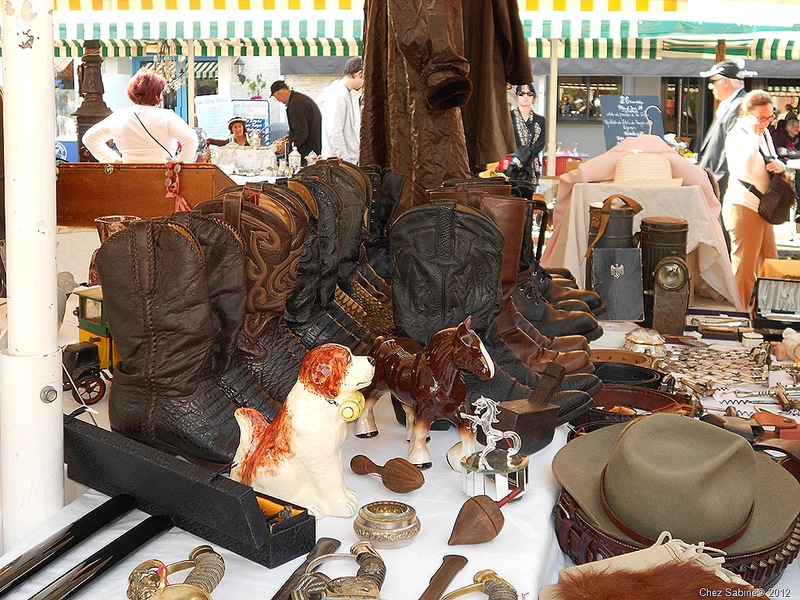 But, then there are vintage books, outrageously fabulous posters and prints, vintage clothing (and shoes!) 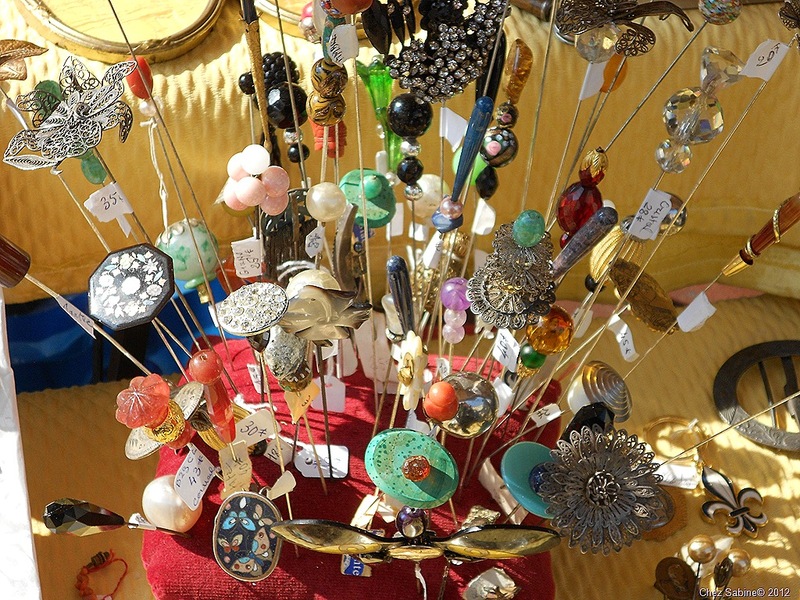 and jewelry and even eyeglasses and countless other treasures that make the Nice flea market one of a kind. Oh, and the dogs, always les chien. Take a look. You can roll these posters up to take them home. They come in all sizes. 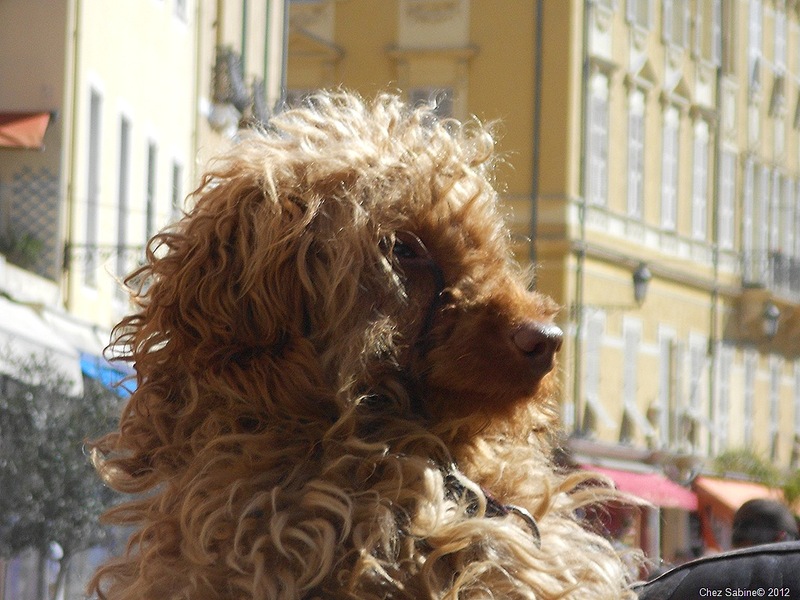 This mop top is one of the many stall dogs. They belong to the owners and spend their day among the treasures. Hat pins galore. This was only a small sampling. Is this a dog’s life or what? These small chocolate molds make perfect gifts for the baker on your list. They’re a cinch to pack. Tiny, delicate Limoges boxes are popular collectibles. 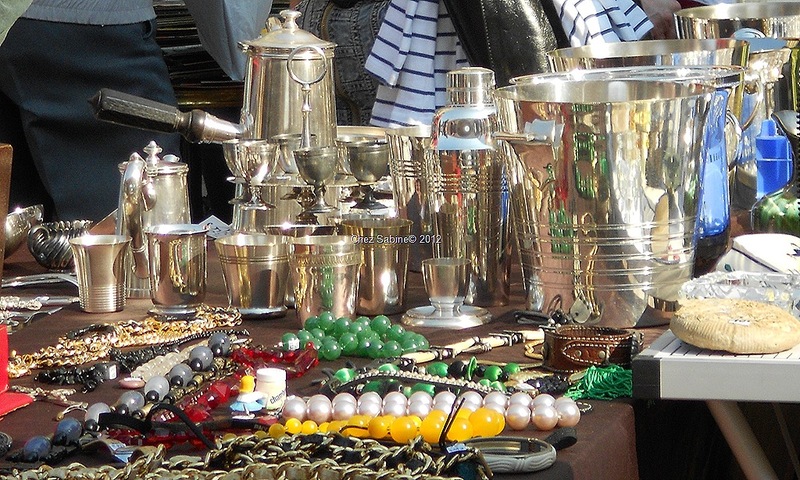 You’ll find a wide array of costume jewelry along with precious metals and gems at the French flea market. The market is a high energy venue, and at any moment you might get a free concert from local talent. 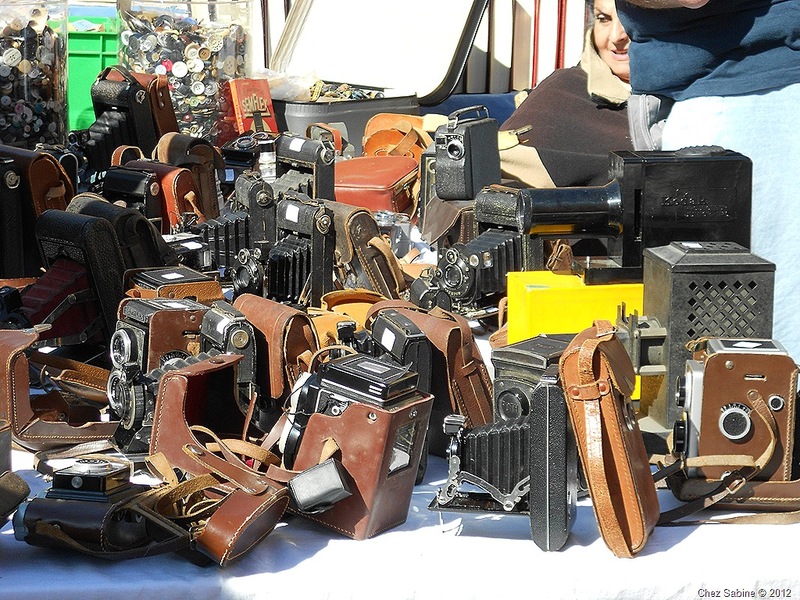 Photo bugs will have a field day going through the many vintage cameras available at the market. 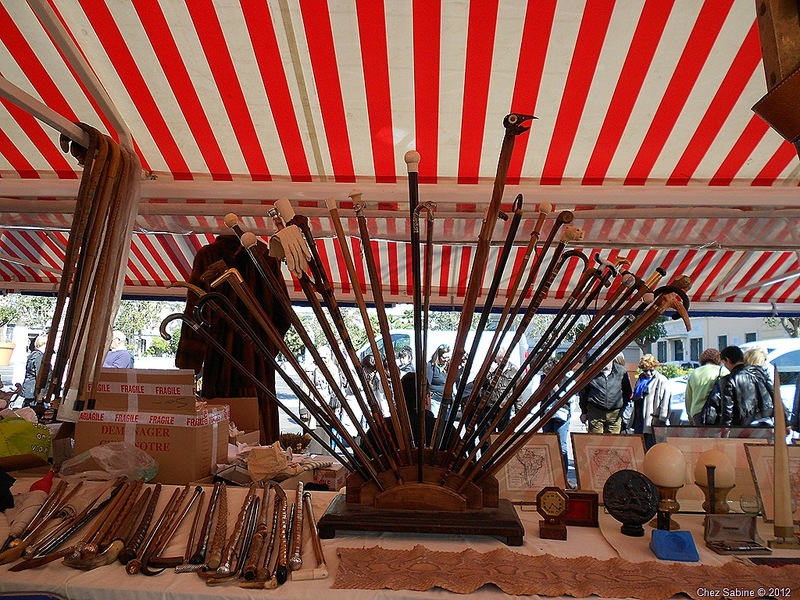 Any one of these handsome walking sticks or canes would make a terrific conversation piece. I love these mantel clocks. They’re elegant, beautiful pieces of art. I’m thrilled that I prefer to appreciate them from afar, because they weigh a ton. However, I understand if you must take one of these timepieces home. 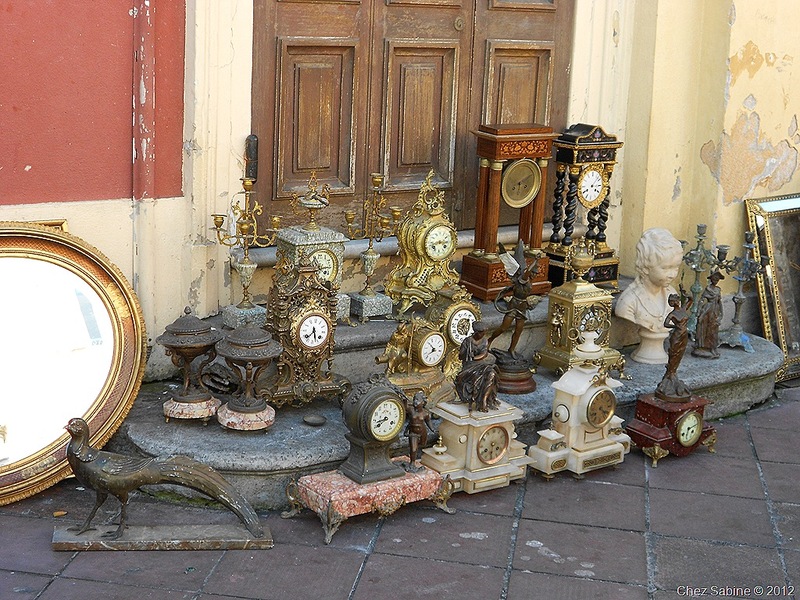 Aside from the outrageous shipping (and you’ll want to purchase insurance) cost, keep in mind that if the clock isn’t in working condition, you might be out of luck finding someone in your area who can make repairs. Antique clock repair is, literally, a dying art, and you might have to ship it elsewhere to have repairs made. So, that clock that might cost you $600 at the market, can end up costing more than triple that with shipping and repairs. Are you sure you can’t live without one of these beauties? This stall has a bit of everything. Personally, I’m drawn to that gilded mirror. But that’s the kind of piece you can find at home, for a lot less. But, it’s certainly pretty to look at. 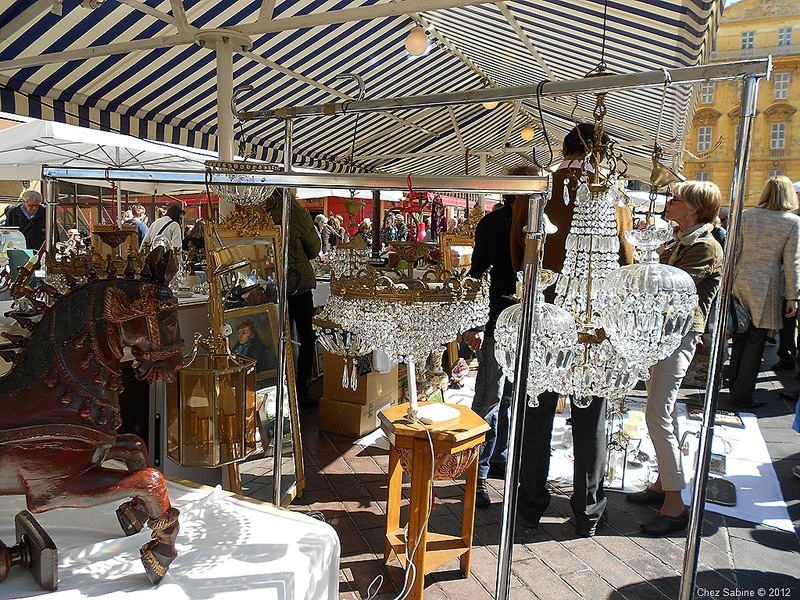 OK, let’s say you fell in love with one of the many crystal chandeliers at the market, You could, with a bit of work and imagination, get it home yourself, especially if it’s not too large. Trust me, it will be an adventure. First, take plenty of photos so that you know what goes where. Start by carefully dismantling the crystals (I’d wrap them in my clothes if it’s at the end of the trip), then check to see if you can take the metal arms apart. (if they’re glass, that’s a whole different endeavor and you’ll need to have it packed and shipped professionally, in which case, reconsider the purchase.) Go ahead and ditch any wiring because you’ll have to rewire it to get the fixture compatible with American electrical outlets. Of course, if there are any light bulbs, get rid of those, too. I know this isn’t for everyone, but if you’re even just a little handy, you can do this. When you get home, whoever rewires the chandelier can probably put it back together for you. And washing and reattaching the crystal prisms are the easy parts of this crazy idea. 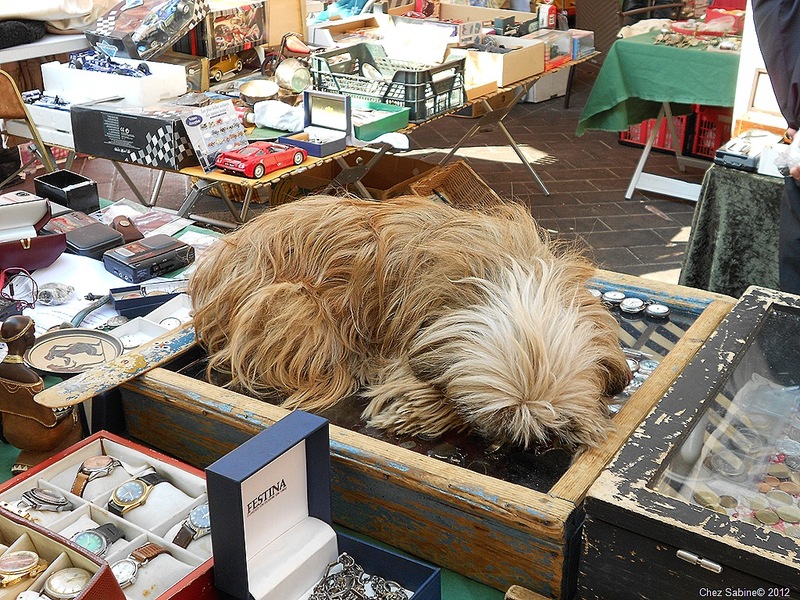 This lucky pup lies among vintage Bally shoes, Chanel and luxurious furs. I love the pink glow. 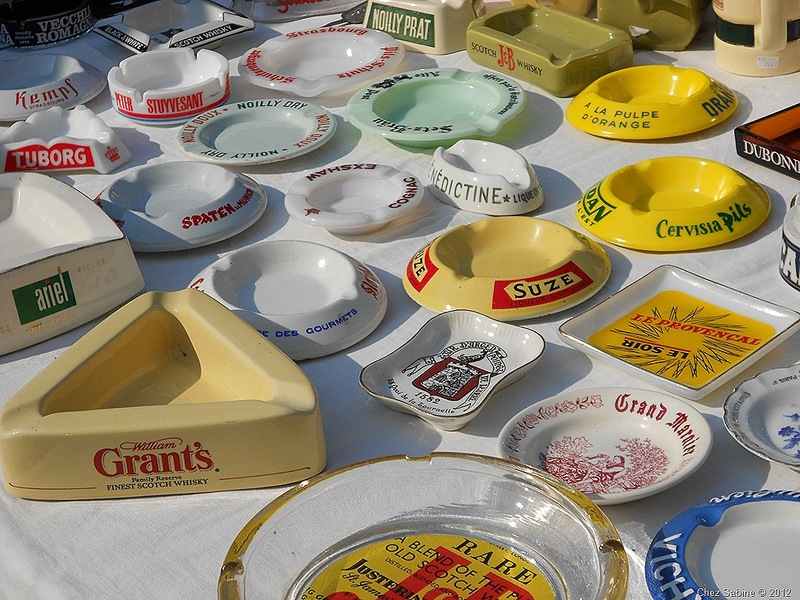 I’ve always wanted some of these fabulous French ashtrays, but never got around to buying any. Forget about soiling them with ashes, instead they’d make perfect containers for your keys, rings, watches, cuff links and loose change, some would even work as coasters. Me? I’d spritz a bit of bleach on them to get them super clean, then use them for nuts or olive oil dip when I have guests. 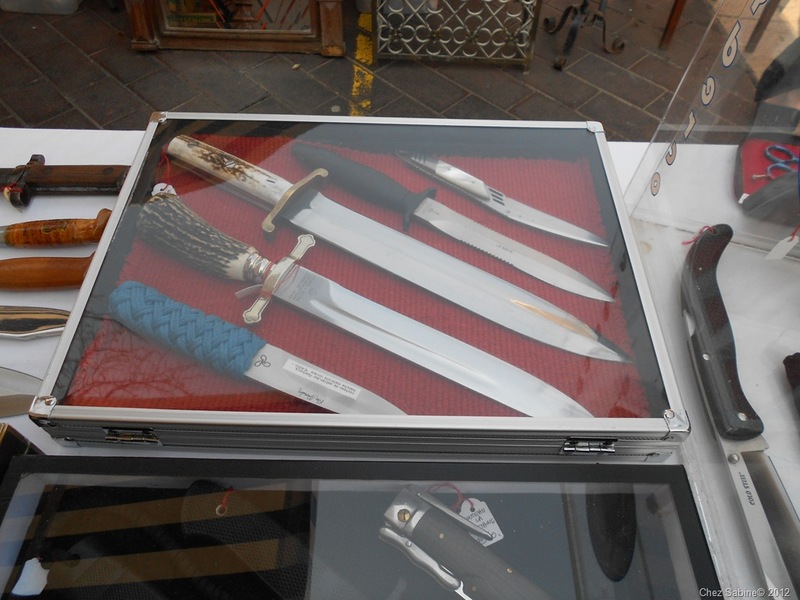 Part of the mystique of the market is the sheer range of merchandise. There’s literally something here for everybody. Wander through this eclectic mix and see if you don’t agree. I don’t suggest you try taking this delicate Art Deco lamp home yourself. That’s original vintage glass you’re gambling with. I don’t know about you, but all of this shopping and browsing makes me hungry. 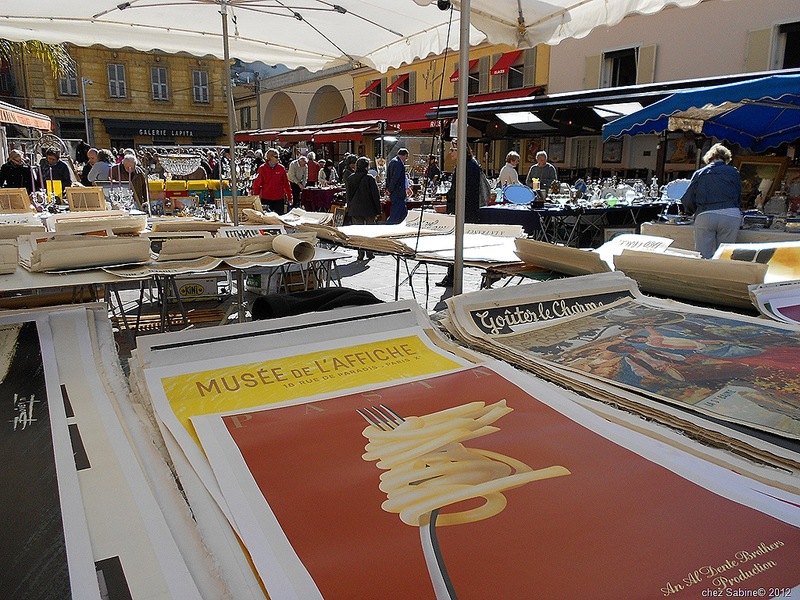 Happily, both sides of the market – along the Baie des Anges and Vieux Nice, are lined with restaurants and cafes. You’re literally just steps away from a memorable meal. When it’s close to noon, you’ll start seeing well-dressed servers balancing plates of steaming food from the cafes to the stalls where the vendors are served the plat du jour among their treasures and gawking tourists. Everyone seems to be enjoying the good life at the market. In fact, I heard this exchange between two vendors late one Monday morning. Indeed. And to help you decide on lunch, most of the eateries post their plat du jour or daily specials (and prices) either on a two-sided chalk board near the edge of the restaurant or on a board up on a wall near the entrance. All restaurants post copies of regular menus outside. The side along the water is loaded with seafood restaurants displaying just-caught fish on ice so that you can get up close and personal with your intended meal. And here you’ll encounter seafood restaurant employees trying to hand you coupons offering free champagne if you choose their establishments. I’ve never selected those, but have seen people happily digging into tiered platters loaded with steamed crustaceans and myriad varieties of fish. 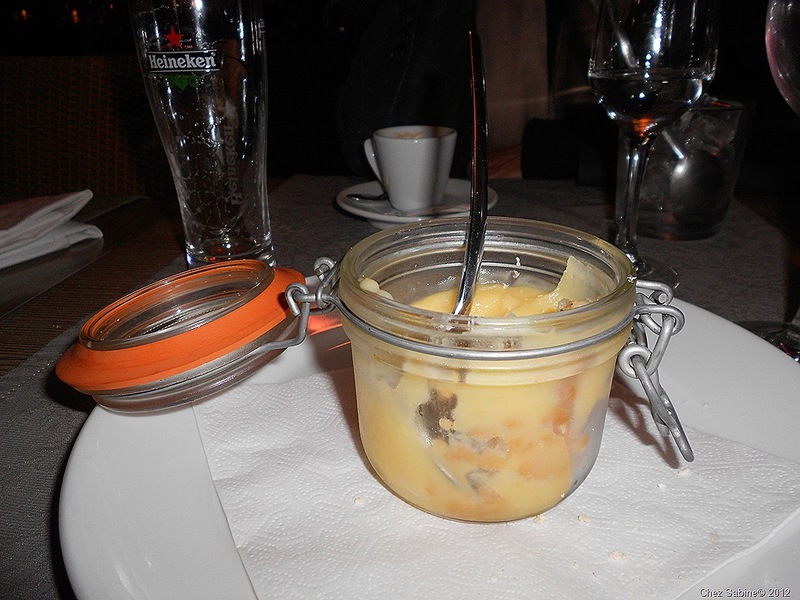 I find myself, more often than not, frequenting the restaurants on the Vieux Nice side. There seems to be a little more action and sunshine over there. 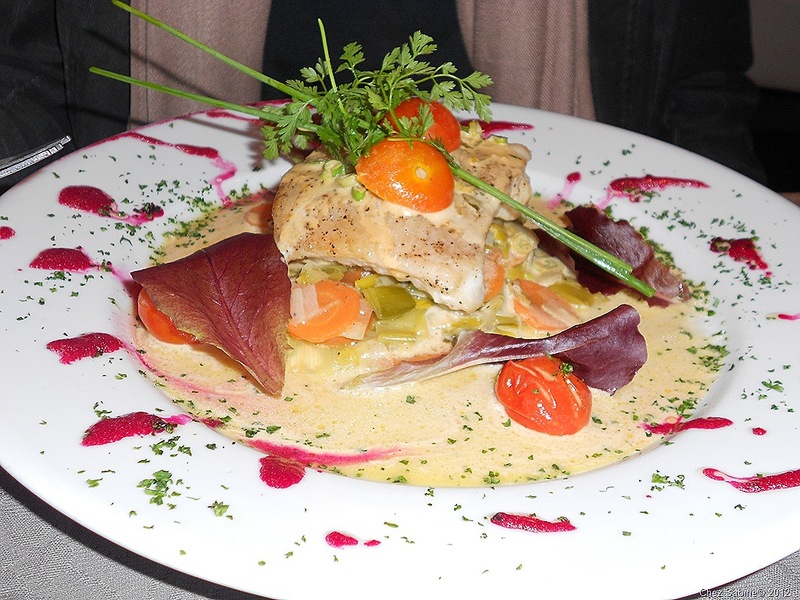 And one restaurant in particular, La Favola, tends to have the best daily specials. 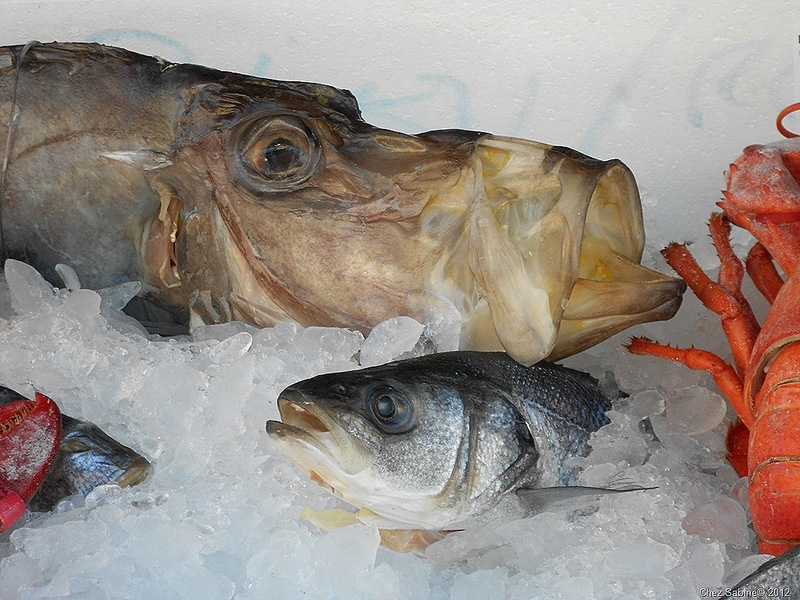 Sides of the market aside, the quandary comes when it’s time to select between the freshly caught durad coated in sesame seeds or the steak and roasted potatoes or the delicate je ne sais quoi fish sitting on a bed of leeks and carrots and surrounded by a dreamy butter sauce. 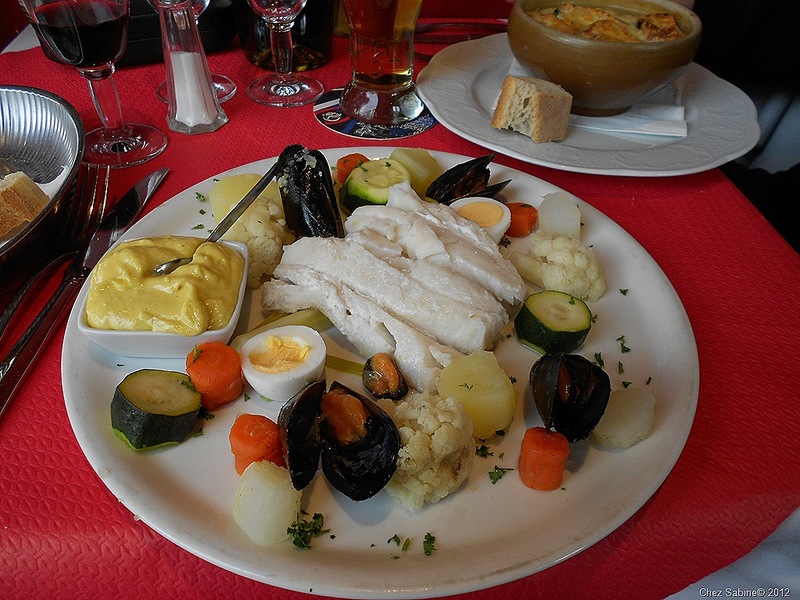 But in Nice, there are some local dishes you might want to try, so you’ll have to consider Le Grand Aïoli, This simple meal comes as a large platter arranged with fresh, seasonal vegetables, hard-cooked eggs and salt cod all waiting to take a dip in the butter of Provence – the assertive, not soon forgotten aioli. And a word about the wine. First, those two vendors discussing red or white weren’t the exception – just about everyone is drinking wine or beer at lunch. Remember, these are leisurely lunches. My color of choice is red, but I always resist buying a bottle because the mark-up makes me twitch. I refuse to pay more for my wine than I do for my meal. That doesn’t mean I don’t indulge. Most (not all, so ask) of the restaurants will offer a carafe or pichet (cute little earthenware pitchers) of wine in a couple of sizes. This is so much less expensive than a bottle. And, no kidding, I ordered a carafe of the house red pretty much everywhere I went and was never disappointed. OK, once I was disappointed but it was entirely my fault. I’ll warn you, if you don’t want a sweet red wine with fizz, do not, I repeat, do not order a Lambrusco. You’ve been warned. But other than that one slip-up on my part, all of the house wines were perfectly fine. Most of the restaurants offer both indoor and outdoor seating, but if you’re not there when they start setting up for lunch, all of the outdoor seats will be snapped up pronto. So, now it’s time to sit down for a meal at the market. What’ll you have? 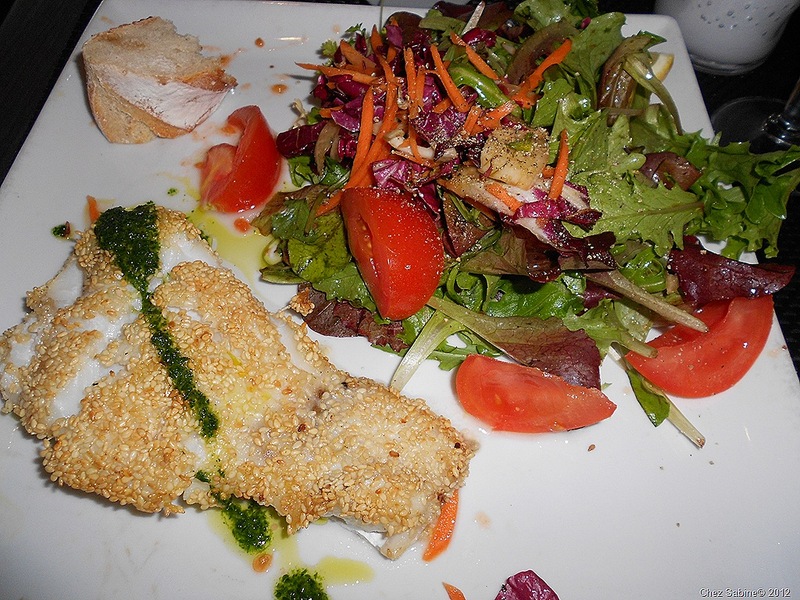 Often, as with this sesame-crusted durad with a dribble of pesto, the plat du jour combines meat or fish with a large mixed salad. 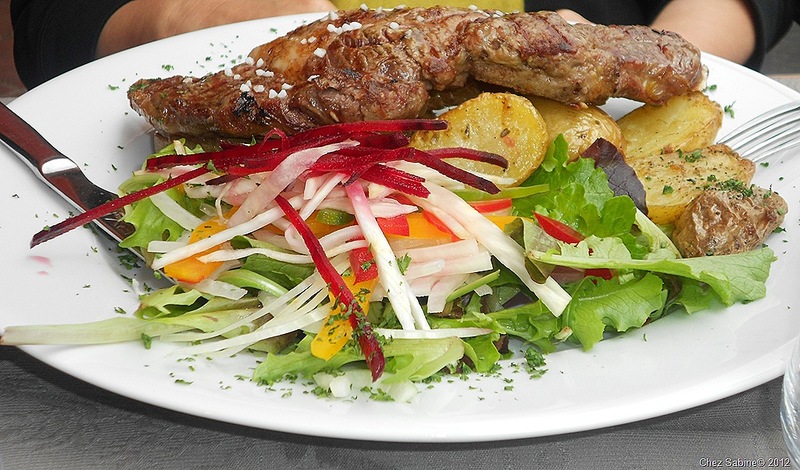 I ordered a mini entrecote steak (ribeye) with roasted potatoes and a gorgeous salad. 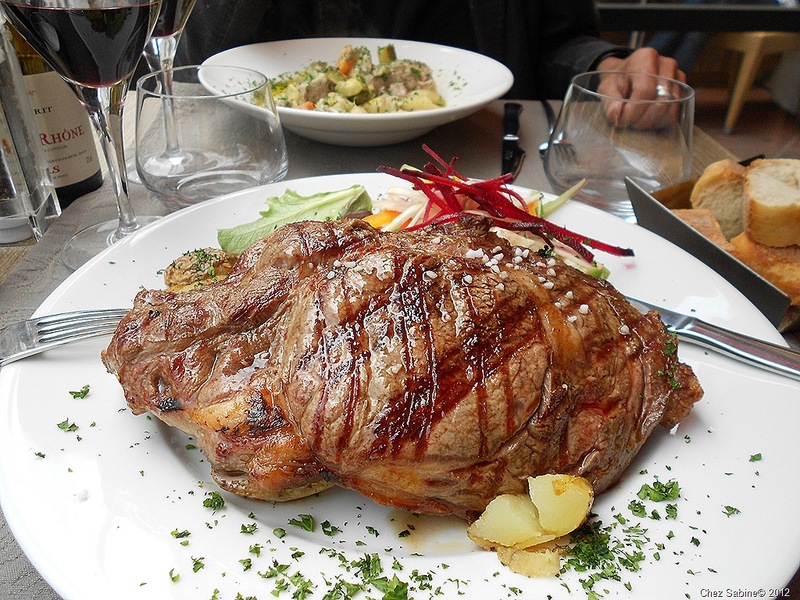 It seems that the French have their own idea of the meaning of the word “mini.” This thing was huge and could have served a family of four. I mean, really, is this nuts or what? It was, however, beyond delicious. And I love that most of the grilled meat I ordered was simply seasoned with a little pepper and sea salt, letting the flavor of the beef shine. Of course, I always like to gild the proverbial with a healthy dab of bracing French mustard. Probably my favorite condiment in the entire world. I have no idea what the fish on this pretty plate was called, but I do know that the beet puree reminded me of a lipstick I wore back in the 80s. The buttery leeks and silky sauce provided a memorable meal. I do remember that much. Ok, so this is a Nice favorite, le grand aioli. While I adore the crazy garlic-laden aioli that is schmeared on everything you see on the plate, I find the boiled veggies a tad bland. There, I’ve said it. Just give me the aioli and a baguette and I’m a happy camper. Oh, and if you have romance on your mind in the 48 hours following dining on the pungent garlic sauce, make sure both of you indulge in the aioli. This stuff will not only repel vampires, but those close to you as well. I hope you do love aioli because it’s going to be your best buddy for a day or two. This tarte au citron was served in a little mason jar and provided the perfect ending to a lovely lunch. While the market offers up plenty of pretty objects and stellar food, it’s impossible to ignore the other attraction – the dogs. I love them all, but have to admit that I fell for one in particular. And if you’re lucky, you, too, will get to dine in the presence of Blackie (pronounced Blah-keeee by his French admirers). This big handsome lug belonged to a local, well-dressed, elderly fellow who seemed to have lunch at the market on a daily basis. While Blackie’s owner wasn’t exactly a chick magnet, he did seem to sport lovely blondes to lunch. I suspect that Blackie, who was allowed free rein of the restaurant, and much of the market, was the reason. I admit to being thrilled when Blackie graced my table with his impressive presence. Look at that face. 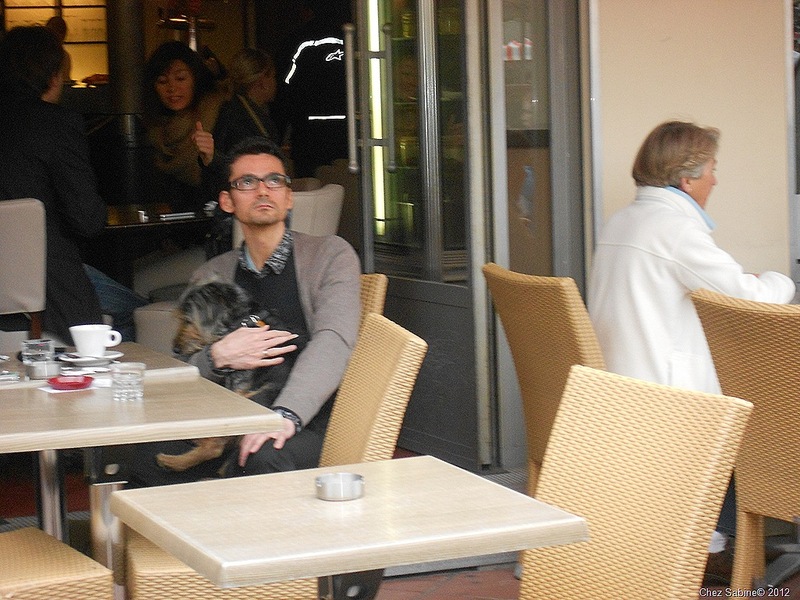 If dogs in restaurants bother you, well, you’re pretty much out of luck in France. They’re everywhere. Bone Appetite. 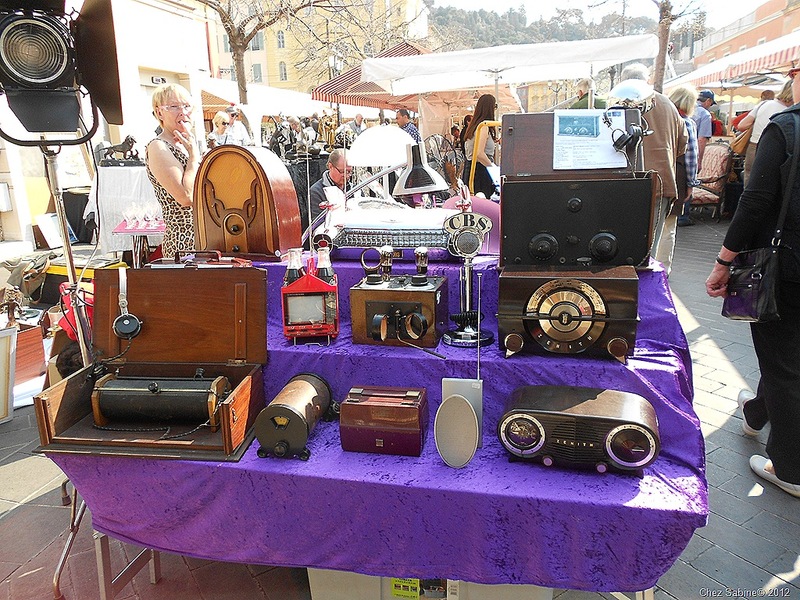 I hope you enjoyed your virtual trek through the flea and antiques market in old town Nice. Let me know what you think, and feel free to ask me any questions. Following you’ll find some tips and products that made my trip a rousing success. And, now, bone up on your Italian, soon I’ll take you on a whirlwind tour of my favorite little getaway on the Ligurian coast. And I’ll give you my secrets for staying there on the cheap and in luxury. Is it open in November? Absolutely. The market is open year round. Rain or shine. Or wind. And, at times, there can be plenty of wind.